Arduino - SPI Devices and connecting them together. If something has connectors labelled MOSI and MISO, then it is an SPI device that can be accessed using the SPI.h library. CS - Chip Select - nominally the first device is connected to pin 10; but any pin can be used, and to connect multiple SPI devices, each device needs it's own CS pin. When a device's CS pin is low, it can communicate. When it's high, it ignores all communications. This allows you to have multiple SPI devices sharing the same MISO, MOSI, and CLK lines. As an example, I'm using the SRAM memory chip 23K256 that I ordered last week. 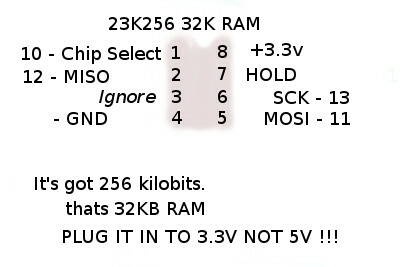 This is an SPI device; the chip 23K256. That's 256 KILO-BITS. There are 8 bits in a byte; so you have to divide that by 8, to get the size more commonly used - 32 Kb. There is a library given in the arduino playground called spiRAM. However, it's got a couple of versions and all agree that it's incomplete and should be updated when someone can find the time. I will look at the library code, see how the chip works and how the software works, and generally investigate. This is perhaps an unusual chip to demonstrate the SPI interface; but I need to use it my mp3 player project.